I get this question a lot. I have made a careful and conscientious choice to not wear a helmet when I’m cycling in urban areas because I strongly believe that it will help improve the overall safety of cycling in the long run. It’s an unintuitive position to take. People have tried to reason with me that because I’ve spent so much money and time developing my brain, and the cost of an injury would be so devastating, it’s clearly more important to wear a helmet. But if we start looking into the research, there’s a strong argument to be made that wearing a bike helmet may actually increase your risk of injury, and increase the risk of injury of all the cyclists around you. Why doesn’t everybody wear a helmet? Let’s first get one thing out of the way: if you get into a serious accident, wearing a helmet will probably save your life. According to a 1989 study in the New England Journal of Medicine, riders with helmets had an 85% reduction in their risk of head injury and an 88% reduction in their risk of brain injury. That’s an overwhelming number that’s backed up study after study. Nearly every study of hospital admission rates, helmeted cyclists are far less likely to receive serious head and brain injuries. These studies confirm what we feel when we’re out for a spin on our bikes: We are exposed. Vulnerable. Needing of some level of protection. But a broader look at the statistics show that cyclists’ fear of head trauma is irrational if we compare it to some other risks. Head injuries aren’t just dangerous when you’re biking—head injuries are dangerous when you’re doing pretty much anything else. There’s ample evidence showing that there’s nothing particularly special about cycling when it comes to serious head injuries. 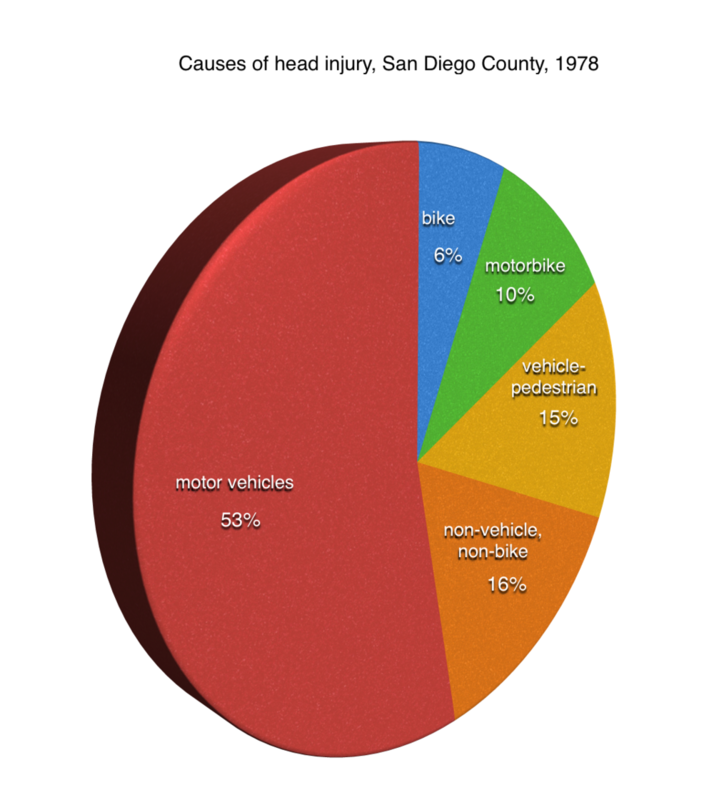 In 1978 a team of scientists undertook an epidemiological study of head injuries in the San Diego area. As part of that study they looked at the overall causes of head injury by transportation type. In each of these three examples we see that cyclists are not the group at highest risk for serious head injury. Let's be clear. I am NOT trying to say that studies definitively show that cycling is safer than driving or walking. The studies that are out there give us mixed messages about the relative safety of the different modes of transport. What I am saying is that these statistics raise an interesting question: If we're so concerned about head injuries, why aren't we wearing helmets all the time? Why do places that have mandatory helmet laws for cyclists not have them for drivers or pedestrians? 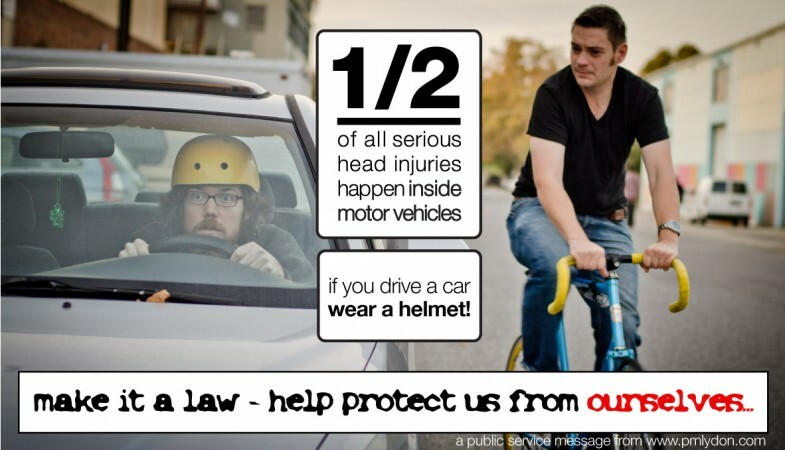 The same 1996 Australian study suggests that a mandatory helmet law for motor vehicle occupants could save seventeen times more people from death and serious head injury than a similar law for cyclists. Short of suggesting all teen drivers and their passengers wear helmets, the survey determined that states which maintain the strictest graduated driver licensing laws (GDL) are the most effective in reducing both brain injuries and fatalities among young motorists. Did you catch that? Despite the fact that car accidents are the number one cause of all fatal head trauma among teenagers, the suggestion that teens wear helmets when they drive is simply brushed off. The passage treats the idea of mandatory driving helmets as completely preposterous. Yet we insist that children wear bike helmets (in fact, in some places, it's the law) despite data that shows kids are more likely to die of head injuries riding in a car than riding on a bike. Children and toddlers on foot are far more likely to receive traumatic brain injuries than cyclists, yet parents who place protective headwear on their walking toddlers are openly ridiculed. In other words, if the reason we are supposed to wear helmets while biking is to prevent serious head injury on the off-chance we get into an accident, then why is it socially acceptable for pedestrians and drivers to go about bare-headed? Why has cycling been singled out as an activity in need of head protection? There's an important caveat to the results of that 1989 New England medical study: It shows that bike helmets may reduce the risk of head and brain injury by 85-88%—but only for those who get into accidents. If we take a closer look at the article we see that both the experiment and the control groups studied are those who have already been hospitalized for bike injuries. If one were to examine the medical and epidemiological literature on bike helmet effectiveness, you'll find the exact same condition over and over: Studies show that helmeted cyclists who are hospitalized are far less likely to have serious head trauma than bare-headed cyclists that have been hospitalized. But wouldn't this be true, regardless of the activity? Logically, helmeted drivers should also receive significantly fewer head injuries than bare-headed drivers. Similarly, helmeted pedestrians should be less likely to receive serious head trauma than bare-headed ones. But studies that compare head injuries for drivers and pedestrians simply don't exist as there aren't enough helmeted drivers or pedestrians to make a comparison. Science, after all, can only be accomplished on observable phenomena. If no one wears a helmet when they walk down the street, how can we measure the effectiveness of helmets on pedestrians? In other words, one of the reasons we think helmeted cyclists are safer than unhelmeted ones may be due to availability of information more than actual levels of head safety. Maybe that explains why there's no comparable fear of driving or walking without a helmet. But say you are someone who is concerned enough about head injury to wear a helmet while you're driving or while walking down the street. Is there an argument that says that wearing a helmet actually increases risk of injury? Turns out that there is. There is some evidence that wearing a helmet may directly increase your chance of getting injured in the first place. In 2001, an article in the New York Times reported that the rate of bicycle head injuries had risen sharply — an increase of 51% — during a ten-year period when bicycle helmet use became widespread. This during a time when statistics showed an overall decrease in bicycling in the United States. No one knows for sure why head injuries among cyclists increased, but there are a few theories. First, wearing a helmet changes how drivers perceive the cyclist. A University of Bath study showed that drivers, when overtaking cyclists, gave helmeted cyclists significantly less space than they gave cyclists who don't wear head protection. The study found that drivers were twice as likely to pass closely to a helmeted cyclist, and that drivers passed an average of 8.5 cm (3 1/3 inches) closer when the researcher was helmeted than when he was not. Not only does this increase the chance of being clipped by a vehicle, it leaves cyclists with far less maneuvering room to avoid other potentially injurious road hazards like potholes and icy patches. Second, the design of the helmets themselves may increase the chance of some types of injuries when incidents do occur. Three separate studies have shown that bike helmets may increase the probability of certain types of neck injuries. There's some evidence that having an enlarged piece of plastic and foam on your head increases the probability of hitting an object that you'd be able to avoid in the first place, or that otherwise glancing contact with a surface becomes a full-on blow when the head is helmeted. Finally, wearing a helmet may create a false sense of security and induce risk-taking that cyclists without head protection might not make. Those wearing helmets may take risks that they wouldn't otherwise take without head protection. There are even some startling statistics that show helmets may have little to negative effects on the incidence of head injuries outside of the cycling world as well. A recent study from the National Ski Areas Association found that, despite a tripling of helmet use among skiers and snowboarders in the United States since 2003, there has been no reduction in the number of snow-sport related fatalities or brain injuries. On the contrary, and 2012 study at the Western Michigan University School of Medicine found an increase in head injuries between 2004 and 2010 despite an increase in helmet use, while a 2013 University of Washington study concluded that snow-sports related head injuries among youths and adolescents increased 250 percent from 1996-2010, a timeframe that also coincides with the increased use of head protection. So as much as helmets decrease the chance of head injury when you get into an accident, they may actually increase your chance of getting into an injury in the first place. There is another significant way that the use of helmets harm cyclists: Bike helmets discourage cycling. An Australian study on mandatory helmet laws concluded that laws that required cyclists to wear head protection actually decreased the number of cyclists on the road. The implication of this study? The fewer cyclists on the road, the less likely drivers will be accustomed to sharing road space with cyclists, ultimately increasing the hazards faced by cyclists and further dissuading people from hopping on their bikes. As an environmentalist, this is very troubling. To improve public health and the environment, we need to do the exact opposite. People should be encouraged to take a quick bike ride, not the other way around. Unfortunately our society has conditioned cyclists to feel unsafe without a helmet, even though wearing one might actually increase the chance of a collision with a vehicle; and even though other activities capable of inflicting serious head wounds are enjoyed bare-headed without stigma. The ultimate way to make cycling safe is to promote a culture of cycling, not bike helmet use. Helmet use is very uncommon in bike-friendly cities like Copenhagen and Amsterdam, where cyclists have been socialized to see cycling as a safe activity and where there is the infrastructure to support it. In order to promote the same culture here, we need to encourage people who don't bike that they should give it a try. If my biking without a helmet can help with that, then great. Especially since it's not conclusive that cycling with a helmet reduces your chance of getting injured. If there was conclusive proof that bike helmets reduce the total number of serious head injuries compared to other normal activities, then I'd reconsider my stance. But if I'm not the kind of person who wears a helmet when I take a walk or get behind the wheel of a car, then there's no logic to me wearing one when I'm on a bike, particularly if I'm confident in my urban bike safety ability. Meanwhile the proof is pretty strong that vehicles give me more space when I'm biking without a helmet. In a city biking, that's the kind of injury I'm most concerned about. And I want to encourage more people to get on their bicycles, because the more cyclists are out on the road, the safer I'll be. ... it is hard to overstate how our unnatural obsession with head protection is stifling the growth of our bicycle culture. It achieves little, except deterring the most casual cyclists, who also happen to be the slowest and safest ones on the road. I'm not saying that adults should not wear bike helmets. The main point I'm trying to make is that, when compared to other forms of transportation, the fear of head trauma from cycling is likely out of proportion to the actual risk — and that fear is leading many advocates to admonish bare-headed cycling, contributing to a culture that's counter-productive to the overall safety of all cyclists. If you're not comfortable biking without a helmet, then by all means, you should wear one. In fact, some studies suggest that those in demographics that have had less biking experience (like children) should, indeed, wear protective head gear (as should teenaged drivers). I, for one, would put on a helmet if I were ever to take on long-distance biking, since I'm not as familiar with sharing traffic patterns with fast-moving cars. But let's not believe that helmets are the panacea of bike safety. It's probably far more helpful that cyclists learn how to assert their road rights while also safely interacting with traffic. Understanding how to navigate your bike through the streets is far more important to a cyclist's safety than the helmet on their head. If you do choose to wear a helmet when biking, don't stop there: Learn how to properly and safely interact with vehicles. Share the road. Know your rights. Learn to take the lane and feel comfortable about it. Not only do motorists treat you differently when you're wearing a helmet, studies show that helmets may be giving you a false sense of safety. I've seen cyclists speed through red lights, ride at night with no lights, pass between the curb and traffic into the path of a turning vehicle, and treat stopped automobiles as if they were permanently immobile. Those are all dangerous maneuvers, regardless as to whether or not you're wearing a helmet. For me, perhaps future studies will show that wearing a helmet actually reduces the chance of injury, or that vehicles will start giving helmeted cyclists more leeway, or that seeing helmeted riders does not discourage others from hopping onto a bike. Until then I ride the streets of New Haven without head gear hoping that it will encourage more people to get out on two wheels. Older PostHow serious was the Toronto Ice Storm blackout... really?